Bogotá - From 6 to 9 November 2018 the XII International Forum of Territorial Development "Structural changes in public policy for the rurality of Latin America in the 21st century" will be held in Bogotà. The Forum has been organized by IICA - Inter-American Institute of Cooperation for the Agriculture, FAO, the National University of Colombia, the Scientific Park of Social Innovation of UNIMINUTO - Corporación Universitaria Minuto de Dios, the Pontificia Universidad Javeriana de Bogotá and UNIAGRARIA - Agricultural University Foundation of Colombia. The Forum exists since 2006, when the territorial development policy in Brazil was implemented. 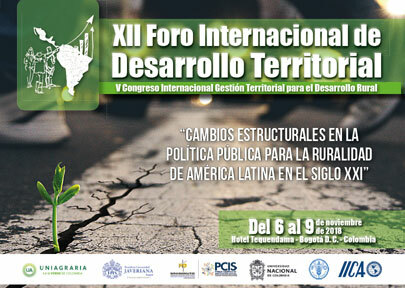 In its 11 editions, an international event on Public Policies of Rural and Territorial Development has been held annually, which IICA has been in charge of in Brazil, becoming one of the most relevant Latin American spaces for debate on issues related to the development of rural territories. This year the Forum moves to Colombia in order to contribute to the identification of the opportunities that the new rurality and rural development with a territorial approach can contribute to the current challenges and situations of the country, as well as to other Latin American countries and the Caribbean. During the last year, two preparatory meetings has been held. The first activity was held in Colombia at the facilities of the IICA representation through a panel of experts for Integral Rural Reform, with the objective of identifying the challenges of implementation on issues related to financing, territorialization and the articulation of public policies and institutions. Subsequently, the preparatory convention at the XII International Forum of Territorial Development was held in Salvador (Bahiá - Brasil).